Army veterinary technicians, designated as military occupational specialty (MOS) 68T, provide a wide range of services to our furry friends, from taking vital signs and giving medications to performing diagnostic tests and assisting with surgery under the supervision of a veterinarian. The job can be more varied than you think. In addition to caring for military working dogs, they serve the pets of military families and care for research animals. 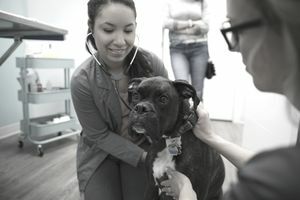 GoArmy.com also recommends that potential veterinary technicians possess an "interest in general science and biology, enjoy helping others, [and demonstrate the] ability to work under stressful or emergency conditions and follow directions precisely." Applicants need normal color vision and a background in biological sciences in high school. No security clearance is required for the job, a rarity in today's military. No one wears the uniform without first learning to be a soldier, whether you wind up behind the gun or giving Sparky his yearly check-up. So off you go, before anything else, to boot camp. From there, prospective veterinary technicians move on to the Academy of Health Sciences at Fort Sam Houston, Texas. The vet tech program lasts approximately three months. Interviewed for the Army Times, schoolhouse deputy chief Dr. John Cheaton said that students at Fort Sam Houston, "learn in 11 weeks what civilian veterinary technicians learn in two years," covering "areas as diverse as toxicology, pharmacology, respiratory and cardiovascular systems, ethics, dentistry, and basic anesthesiology." But training has evolved in response to the events since 9/11: The curriculum now includes treating canine open chest and abdominal wounds. Training culminates in clinical work experience at Lackland Air Force Base's Military Working Dog Hospital. There are four credentials for veterinarian technicians in the Army, according to the Credentialing Opportunities On-Line (COOL) site. Three are covered by GI Bill money and offer increased competitiveness for promotion: assistant laboratory animal technician, laboratory animal technician, and laboratory animal technologist. A fourth, though not covered by financial assistance, allows a more experienced soldier to become certified as a veterinary practice manager. Civilian veterinary technicians must normally have a bachelor's degree and state licensing, so be prepared for post-Army education if you wish to continue working in the field. GoArmy.com suggests that the job search might be aided by enrollment in the Army's Partnership for Youth Success (PAYS) Program. That program may get you access to job openings with employers like John Hopkins, Yale-New Haven Hospital, or the Baton Rouge General Medical Center. You may find yourself in demand out there, too. Veterinary medicine is a fast-growing field, according to the Bureau of Labor Statistics.